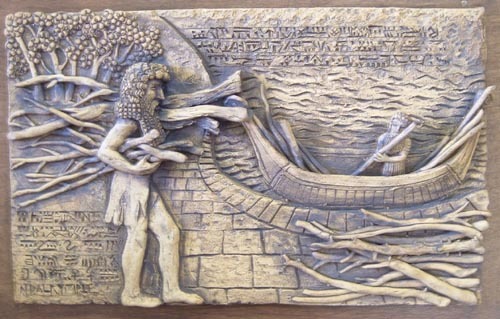 Floods have wreaked havoc on communities since time immemorial, and play a significant role in the mythologies of disparate cultures, ranging from the Gilgamesh of ancient Babylon to Popol Vuh of the Mesoamerican Mayans. But while floods seem to have been prevalent in humanity’s misty past, they may play an even more prominent role in our future. Current climate science indicates a very high probability that the future will bring more intense and more frequent flood events. With a growing and urbanizing global population, hard choices will have to be made about where to build, when to stay, and when to leave. There is not a lot of silver lining when it comes to extreme weather events. But just as myth and religion contain echoes of ancient responses to these events, whether that be Noah’s construction of a great ark in the Bible’s Old Testament, Manu’s grain-collection efforts in India’s Shatapatha Brahmana, or Magarus’ escape to the high mountains in the Greek Deucalion, the modern world offers us a range of practical (and sustainable) means of both preparing for and responding to a flood-prone future. Coupled with local adaptation responses that build on the historical experiences of people across the globe, rapidly-advancing modern technologies offer us new tools for addressing unprecedented increases in flood risks, which may be critical for easing suffering and saving lives. Satellite technologies and unmanned aerial vehicles (UAVs), for example, could form the vanguard of future flood preparation and response. Here is an account of how new satellites can help predict floods months in advance by monitoring changes in groundwater levels via shifts in gravity. We wrote about how recent floods in the Balkans, while devastating, could be an opportunity to forge cooperation and trust between nations in the region. In that context, Patrick Meier of iRevolution provides a detailed account of how UAVs assisted in flood damage assessment and humanitarian assistance. Namely, UAVs were utilized as a critical means of getting to difficult-to-access, flood-affected locations, and delivering assistance to people who might have otherwise been overlooked. There are germs of wisdom in the stories of our ancestors. If you wish to survive and prosper, prepare for floods. Prepare for variability. Myth and religion give us epic boat-construction and extraordinary swimming abilities. Modern technologies, like satellites and UAVs, give us extraordinary foresight and the ability to reach otherwise unreachable places. In a projected future of increased flood risks, whether or not we expand and develop these technologies may indicate whether or not we’ve been listening to our forbears. By Caitlin Werrell and Francesco Femia in climate and security, climate-security, risk on July 8, 2014 .